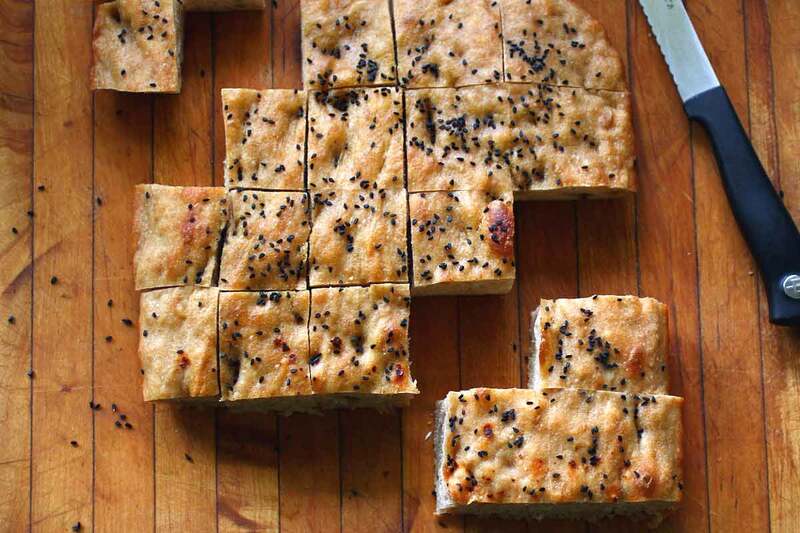 Flat bread not flatbread and not quite focaccia this umm bread is a riff on my go-to flatbread, the Afghan Home style Naan from the wonderful Flatbreads and Flavors Cookbook. 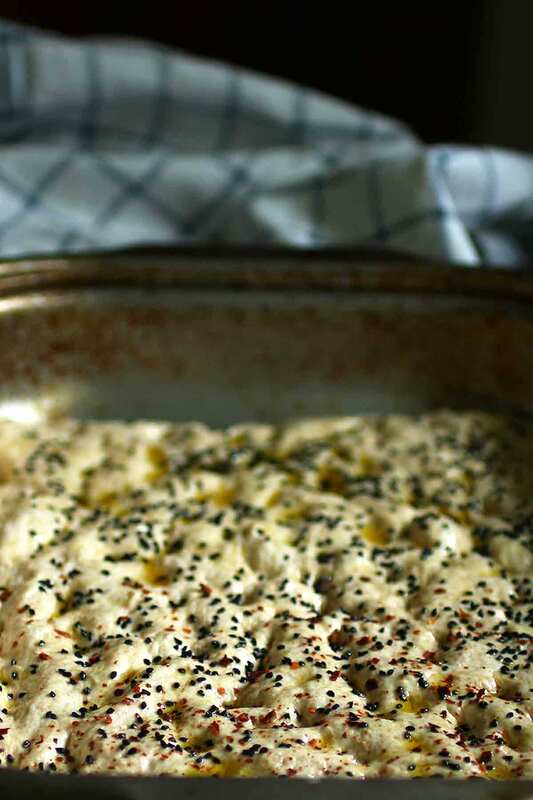 The yogurt adds depth often missing in breads without an overnight proof, tang might even be too strong a word, it’s the ingredient that adds flavor without quite being identifiable. The yogurt also keeps the bread soft for a couple of days. The charnushka seeds look stunning and add a pleasant bite of oniony peppery goodness. I bought mine at Penzeys to use as a topper for rye bread but I also put them in with pan fried potatoes and onions. I made this batch with sandwiches in mind but also put it to good use making sure that the bowls from last night’s pasta dinner were sopped clean. You know you’ve made something special when your significant other, who gets fresh baked breads at a just slightly below the I work in a bakery rate, goes in for another thick slice and tells you that this bread is really good. 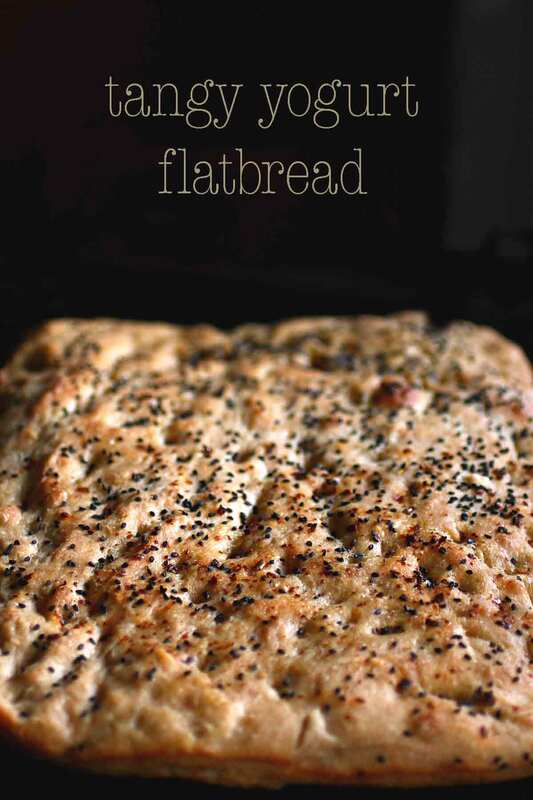 This flat bread is part of a series. I baked it to make pulled lamb sliders but realized it deserved its own post. Then the same thing happened with the lamb. So tomorrow I will post my slow cooked leg of lamb recipe and then finally the sandwiches that started it all. This is actually how I cook every week, recycling while making every effort to have each meal rise above ‘leftovers’. So until tomorrow, enjoy the bread. In a large mixing bowl combine the yogurt and boiling water. Stir to combine and allow to cool to just warm so that it’s not too hot to kill the yeast (105-110F). Add the yeast and whole-wheat flour. Stir and cover for an hour or two, until well bubbly. Add the salt and the bread flour and thoroughly combine. Allow to rest and then using a dough scraper, the dough hook of a mixer, or your hands (The dough is wet so I usually use a dough scraper- like this one) knead or fold the dough until it is smooth and elastic. Allow to rise until doubled in volume. 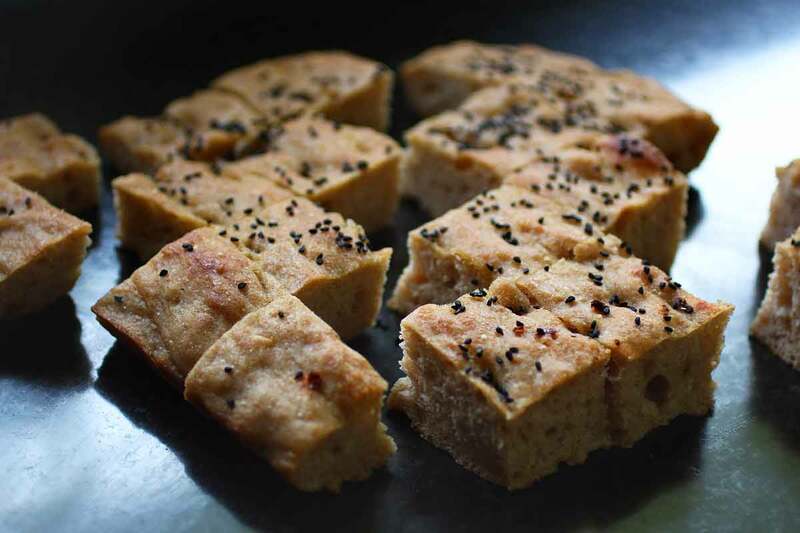 Place the dough in a well-oiled 9 ½ by 14 baking pan and press dough out to the shape of the pan. Allow to rise for another twenty-thirty minutes. Dimple the dough with your fingertips. Sprinkle the bread with the seeds and pepper flakes. Add the salt and the bread flour and thoroughly combine. Allow to rest and then using a dough scraper, the dough hook of a mixer, or your hands (The dough is wet so I usually use a dough scraper) knead or fold the dough until it is smooth and elastic. Allow to rise until doubled in volume. i only have greek yogurt.would that work?